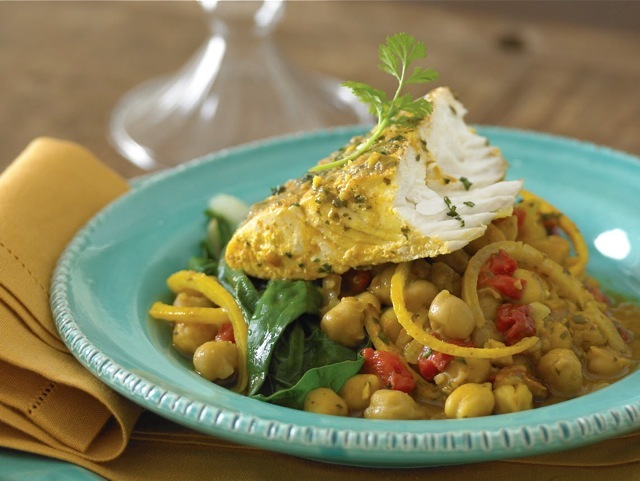 Fish with chickpeas is a very popular dish in Morocco, especially in Fez and Rabat. A firm fish such as sea bass, snapper, halibut, or cod will work very well in this tagine. It is particularly delicious served with braised Swiss chard or a combination of braised greens, such as Swiss chard, kale, escarole, collards, etc. If you do not have time to roast the peppers, use 8 jarred piquillo peppers instead. If you do not have time to make chermoula, rub the fish with a little fresh lemon juice, olive oil, and salt. About 4 hours before cooking, rub the fish with chermoula and refrigerate until needed. Arrange the fish fillets atop the chickpeas. Bring to a gentle boil, reduce the heat to low, cover, and simmer until the fish appears opaque when probed with the point of a knife, about 15 to 20 minutes. Adjust the seasoning of the pan juices and sprinkle with the remaining cilantro. Serve hot, warm, or at room temperature, over couscous if you like. Chermoula is a marinade for fish. Make your own a day or two in advance.